Compared to some of the largest refugee crises in Europe, the genocide and exile of Circassian people in Alexander II’s conquest of the Caucasus in the mid-1800s is all but forgotten about. However, the Circassians were, in fact, the first stateless people in modern history. By 1864, the state of Circassia had lost the northeast shore of the Black Sea, which now forms a part of the Russian South, and after 600,000 of its native people had been slaughtered, the surviving villages were uprooted. While in the West the Circassians were an “extinct race”, among the Ottoman Empire, where the remaining population had been displaced, “Circassian” became a term for “highwayman”. Today, the Circassian diaspora is found in Israel, Turkey, Syria, Jordan and across the Middle East, while a small amount of the population actually resides in the Caucasus, in Nalchik and Sochi (the last capital of the independent Circassian state). 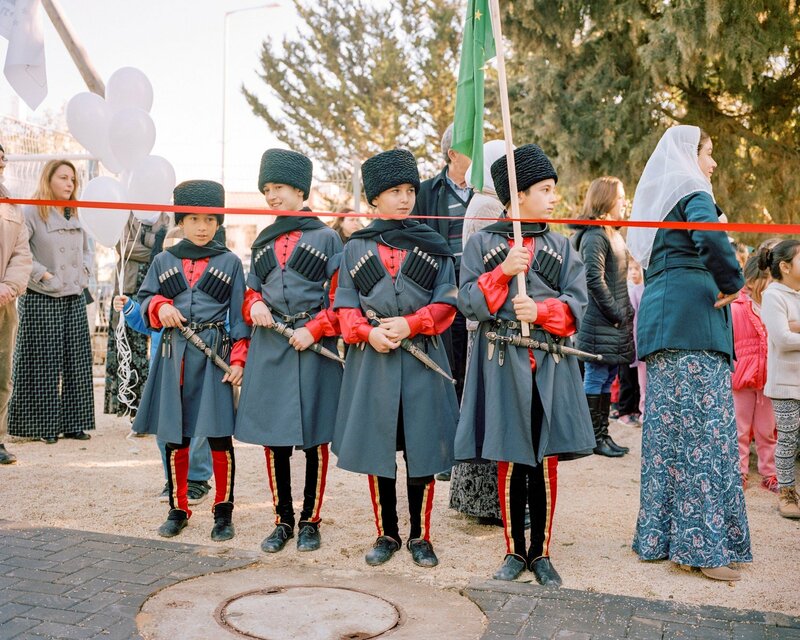 British photographer James Arthur Allen travelled to Israel’s Kfar Kama, which is among the only remaining villages in the world where Circassian continues to be taught and spoken. Allen’s interest in the Circassians arose while the photographer had been shooting his ongoing series on Georgia, entitled The Land of Wolves. “I realised that in many ways the Georgians aren’t always Georgians, the entire country is made up of different tribes,” he says. Apart from Circassians, the other tribes that once composed the Caucasus include the Balkar, the Karachais and the Nogais. Researching Circassian history, Allen had found that not only were British maps of the 1800s amongst the few to recognise Circassia, but the very Circassian national flag was designed by a Scotsman, David Urquhart, in an attempt to unite the Circassian tribes into one military force — hence the star-and-arrow design, each star presenting a different tribe. Today, the flag can be spotted on many of Kfar Kama’s restaurants, community centres and schools, while “Adiga” (Circassia’s native name) or “Adiga forever” is emblazoned on its streets and walls. “Everyone in the village is fiercely proud of being Circassian. If you ask them where they are from they are not from Israel, they are from Circassia. The history of genocide is ingrained in their psyche, which is why they don’t marry outside of the Circassian community. It’s common for guys from Nalchik to travel here to find a Circassian bride,” the photographer explains. Kfar Kama has established itself as a second home for Circassian culture: each year children from Jordan and Turkey travel here as part of a summer camp to learn more about their heritage. One of the reasons for this is that schools in Kfar Kama are allowed to teach their own curricula: “Up until the age of 13-14 the kids attend only Circassian schools, where they are taught Circassian, Hebrew, English, Arabic, among other Circassian customs, such as traditional dance and accordion music. Then they go to Israeli school.” Once of the most significant parts of Circassian traditions is habze, a cultural code that is followed by all generations. A true Circassian must never interrupt their elders, respect women and strangers and even invite an enemy to stay in their home. “As I’d learned in Georgia, it’s all about trust. Before anything I had to get a blessing from the mayor. By the end of the week, people would invite me to stay with their family. They fact that I’d been to the Caucauses helped because they knew I’d made the effort and could understand the tensions in the region,” Allen recalls of his arrival to Kfar Kama. “There are direct flights to Nalchik. A lot of the Israeli Circassians go back frequently. They have one big meeting in Nalchik every year.” Outside of events and family visits, it is difficult to return there permanently. Would they go back tomorrow if they could? “Some say, yes. Others say they are part of the fabric of Israel. They hold a social standing this way,” Allen reveals. Loyalty is another Circassian trait: Circassians fought for the Ottoman Turks up until the First World War. In Israel, which is entangled in its own internal conflict, the Circassians are known for bringing people together. “They have their football team which has the Circassian flag on it. In that team, you have Jewish, Circassian and Arab players. They really pride themselves on that,” Allen says. Living in the UK, the photographer had always accepted the idea that national identity could be inclusive. “I understand that I’m the sum of different cultures. When you go to the Caucasus, it’s an entirely different attitude. They say, ‘this is what we are’ and ‘this is the way it has been’. The fact that these people have been removed from it, but they are still so fiercely guarding that culture is quite an eye opener. It’s why I find it so fascinating,” Allen says. The series, Adiga, was funded by the Rebecca Vassie Trust as winner of the inaugural Rebeca Vassie Memorial award. 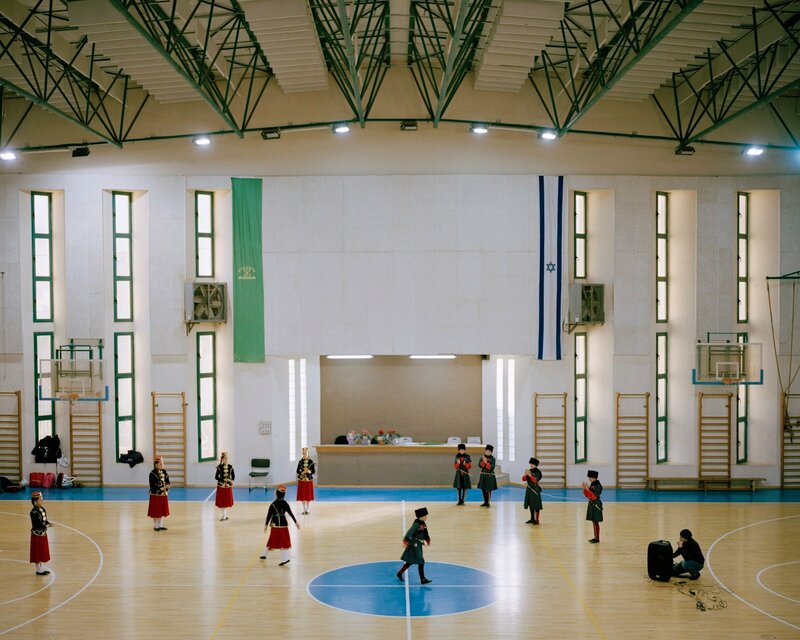 The photographer plans to go back to Kfar Kama and build a bigger body of work devoted to the Circassian population.